Snack Right This Earth Day With SunRidge Farms! Finding healthy organic snacks for the two separate snack times we have in the day gets to be really hard! I am always on the search for a variety of great snacks that the whole family can eat! Lately, my children have been begging for the great snacks we received from SunRidge Farms! We LOVE the variety of great organic snacks we received from SunRidge Farms - there is definitely something that pleases every member of our family and I feel great giving them to everyone! Some of our favorites are the Deluxe Trail Mix and the Sunny Bears! SunRidge Farms' first-ever product is still popular 30 years later. The trail mix is a delicious blend of organic dried apricots, organic roasted peanuts, organic raw almonds, organic dried apples, organic walnuts, organic date pieces, organic sunflower seeds and organic raisins. The result is a snack that tastes delicious, is packed with fiber, iron and a host of other nutrients. I love giving this great mix of healthy nuts and fruit to my son for his snack time! He loves it and is always begging for more! What better way to welcome the spring sunshine than with USDA-Organic Sunny Bears? SunRidge Farms' Sunny Bears are 100% vegetarian and contain no artificial colors, flavors or preservatives. Gelatin-free and certified organic, Sunny Bears are naturally colored the way nature intended with ingredients such as black carrot juice and turmeric. Additionally, a 1-ounce serving provides 70% of the recommended daily value of Vitamin C.
When I saw this fun candy that is actually safe and free of artificial junk, I thought it would be a fun little treat for my son (and also for me!). I love that it is a great source of Vitamin C and naturally colored! 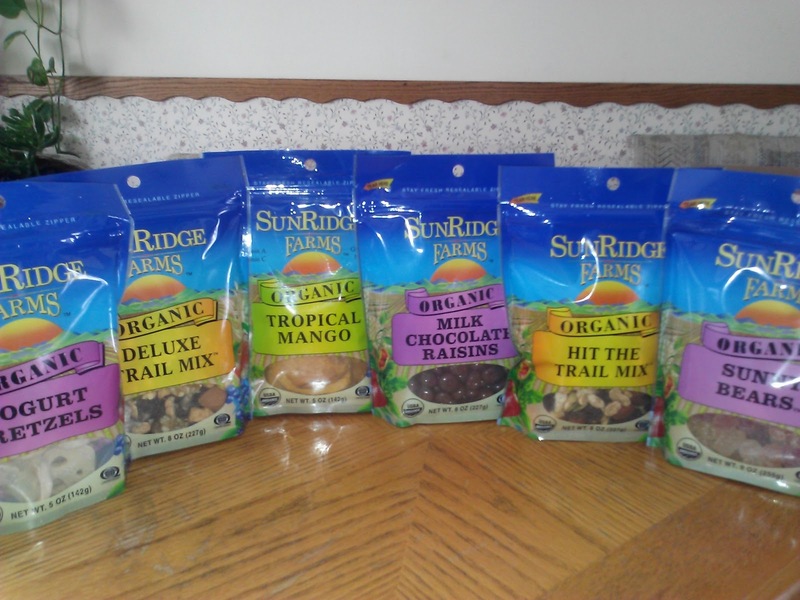 Buy It: You can purchase all SunRidge Farms snacks from the SunRidge Farms website.